We get asked about this so often, that covering it in one of our Q&A sessions just doesn’t do it justice, so we decided to help the average newbie, or even the uninformed veteran, better understand how to act in a studio. It’s a hot button topic, and a little offense can sometimes go a long way in this industry, where the customer is usually right, and most artists didn’t join to get bullied around by the promise of money. So, without further adieu, here is our brief guide to the tattoo and piercing industry for clients. Not all studios are created equal. There are street shops, full custom studios, family friendly spots, adult-oriented providers, appointment only locations, and walk-in friendly businesses. The list is too long to even begin to write it all down, so this entry is intended to help you in the broadest sense, and when in doubt, apply mostly to studios like our’s, so your mileage may vary on all of these. The prevailing wisdom here being, test the waters, and don’t make any assumptions unless you’re pretty sure what kind of place you’re in. 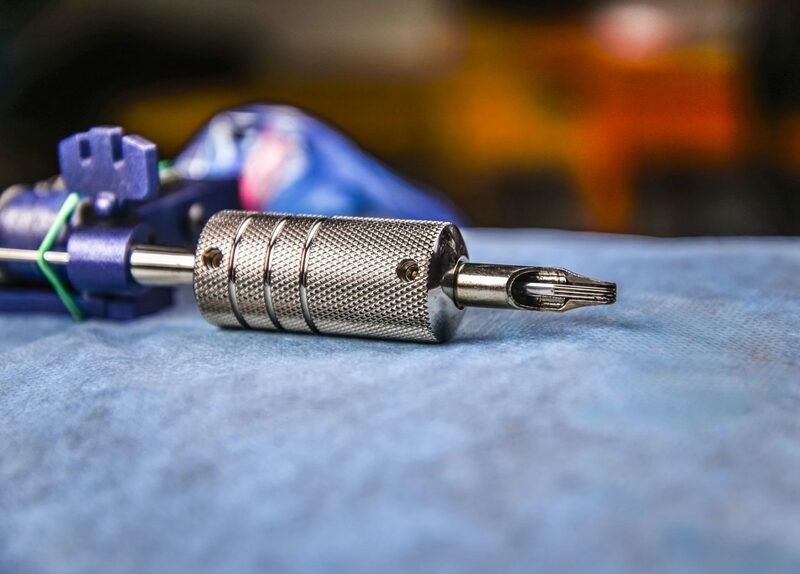 This almost always aggravates a client here and there, but tattooing and piercing have become very high demand services, and they take time to learn correctly. Sure, you can go to the guy up the street who taught himself in a garage and get in today, but we’re going to charge more when you come to us to fix it. Appointments aren’t always a requirement, but they are always recommended. The reason is simple, a studio that takes walk-ins may be slammed the day you want to come in, even if they only take walk-ins. You might get in, you might not. With an appointment, however, you’re sure to get in, barring unforeseen circumstances. Our studio does both, but we’re nearly always booked up with appointments, and walk-in slots can become a very rare commodity. The second half to this issue, is having a little patience. I’m not talking about being willing to wait for an appointment down the road (though you might need to), but talking about being willing to wait a little bit when you arrive. Some times, the previous appointment needs a little more time to really be done right, and any good artist is going to take that time, even if it means pushing the next appointment back a little bit. You shouldn’t try to rush them, unless you would want them rushed on your tattoo, which you shouldn’t. Even if the last appointment ended on time, there may be a little more prep that should be done for your tattoo, or even just some last minute tweaks to the piece. The moral of the story… these things are permanent, stop shopping for them the way you would for your fast food lunch while on break. Most people don’t seem to have any issues with this one in the modern industry, but every once in a great while, someone will get angry at having to put down a deposit. The only real response we can have is, get over it. If you are serious about getting the work done, and have the money to pay for it, a deposit shouldn’t be a sticking point. If, however, you were just hoping to get something drawn up to see if you like it, or don’t have the money to pay for the tattoo, then you shouldn’t be booking. Artists survive either heavily or entirely on commission earned when doing a tattoo, and don’t usually get paid for the time they spend drawing for clients, or sitting in a chair after a client cancels without leaving a deposit. They have mouths to feed, bills to pay, etc. So, we take deposits to pay them if you decide not to show up, but also as a way to make sure we only get the honest clients booking with us. Just because your buddy will do a piece in his garage for $20, doesn’t mean we will. Most studios have set rates that are meant to cover their expenses, and the profit margins are smaller than the whole world seems to think. To perform a tattoo, for instance, can take on a lot of direct costs, not to mention the overhead. You need paper, printer ink (which costs more than blood), drape cloths designed for medical use, medical tape, masking tape, disposable needles and ink, barrier film and bags, green soap, opticide, distilled or filtered water, disposable gloves (in nitrile for those with allergies), and a growing number of other supplies to ensure an infection free process. High quality work also involves machines that can cost into the thousands even without power supplies, upgraded needle cartridges and tattoo inks, etc. Then there is licensing, inspections, insurance, blah, blah, blah… you get the point. Your buddy is cutting corners with his operation, and your health (and art). We don’t cut any corners, and that’s what you’re paying for. We won’t reuse any needles at all, because we aren’t willing to give you a life-long disease just to save a few bucks, and you shouldn’t be willing to let someone do that to you. Again, these are permanent decisions, so stop buying a new cell phone every year by putting more money and time into it than you’re putting into something you get to keep forever. I’m a parent, so I get it. I love my kids… and hate almost everyone else’s. We always ignore the things our kids do that are annoying, while becoming frustrated when listening to another person’s kids do the same thing, it’s built into us. Just remember that when you go into a studio that allows kids, it isn’t a home, and it has dangerous things there, like sharps and bio-hazard. So, keep an eye on them, and make sure they behave when you bring them into a studio. Trust me, it will just save you the headache of having to get super pissed off at someone for not liking something your kid did (you do have to side with your kids after all). The eternal awkward question that comes up every tattoo or piercing, how much should you tip. We’re fortunate here at the studio to have an administrative staff, so our clients don’t have to feel awkward asking the artist this question, but I’ve been asked it several times after finishing a tattoo, so much that I had to come up with a scripted response to it. The basic answer is, we already agreed on a price, and I’m gonna get paid based on that, so you don’t have to tip me. That said, we’ve already gone over how much of the money that comes in, goes to making sure you have a safe and high quality experience, so tips are appreciated. I always recommend treating it like a restaurant, the better the service, the higher the percentage tip, and the worse the service, the lower the percentage tip. In the end, it’s going to have to be your call. Every artist has been working toward this career their entire lives, whether it be drawing as a kid, or studying magazines every day growing up, we’re passionate. Some of us end up in higher end studios, and some end up in run of the mill studios, but we all want to be known for good art. Remember that when you talk to your artist, and when they give you their opinions. While it may be a trend right now to do certain things in a tattoo, a veteran artist can tell you why they won’t hold up over time. You may have a beautifully drawn piece of work that your friend did, but it may not work as a tattoo due to the growth of skin over time. The point, your artist doesn’t want to put their name on something that is going to look bad if they can avoid it, so take their advice into account when getting work done. Otherwise, you might end up with a tattoo that you regret, just because you thought you knew better than a professional. Hopefully that helps out a little when you walk into a studio. There is so much more that we can talk about, because we’ve seen it all over the years, but these should get you off to a good start, or at very least, not get you kicked out of a studio when you’re trying to get work done.